Last week Thursday, my little sister finally turned the big 2-1. This is the day that she has been not-so-patiently waiting for since the majority of her friends have been frequenting bars for months (…or years). After frantically booking a party bus, coordinating sleeping arrangements for the 800 people coming into town to celebrate the big day, making dinner/brunch reservations and attempting to clean my apartment, I realized I hadn’t even gotten her a birthday gift. As always, Pinterest saved the day. 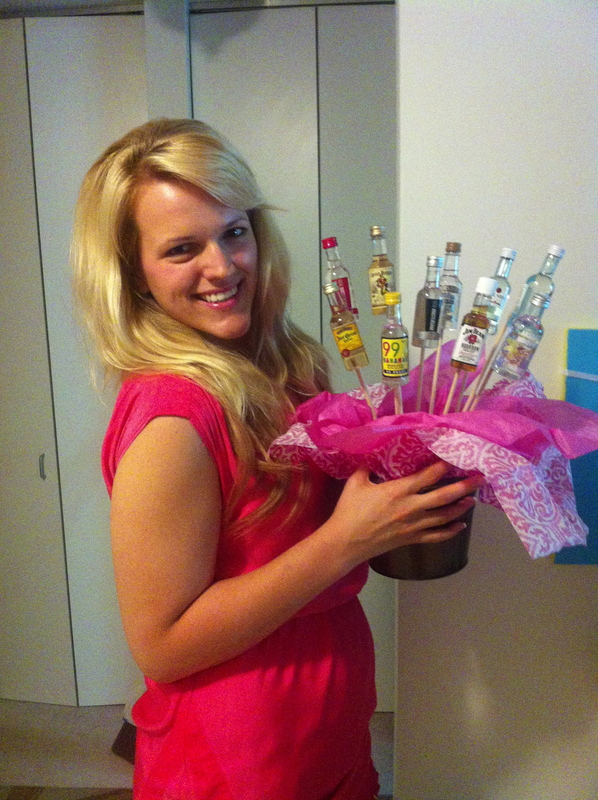 Searching “Gifts for a 21st Birthday” resulted in a number of fantastic ideas, my favorite being the Booze Bouquet (see below). 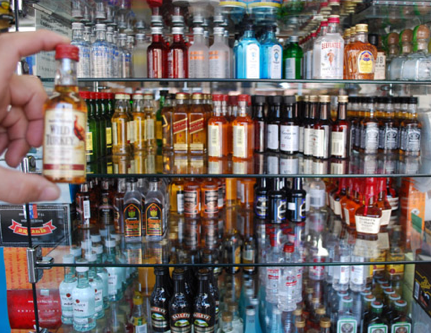 Purchase 10-20 mini bottles of booze. It’s fun to pick a variety because – in theory – the person just turning 21 doesn’t have a lot of experience trying out different types of alcohol. Then go to your local craft store – I went to Michael’s – and purchase a flower pot, green Styrofoam, tissue paper and wooden sticks (I found them in the kids’ craft section). Put tissue paper in the flower pot and place the green Styrofoam on top of it so the tissue paper sticks out. Tape the mini bottles to the sticks. Use clear tape and wrap all the way around the mini-bottles if they won’t stay. Stick the mini bottles into the green foam and you’re done! 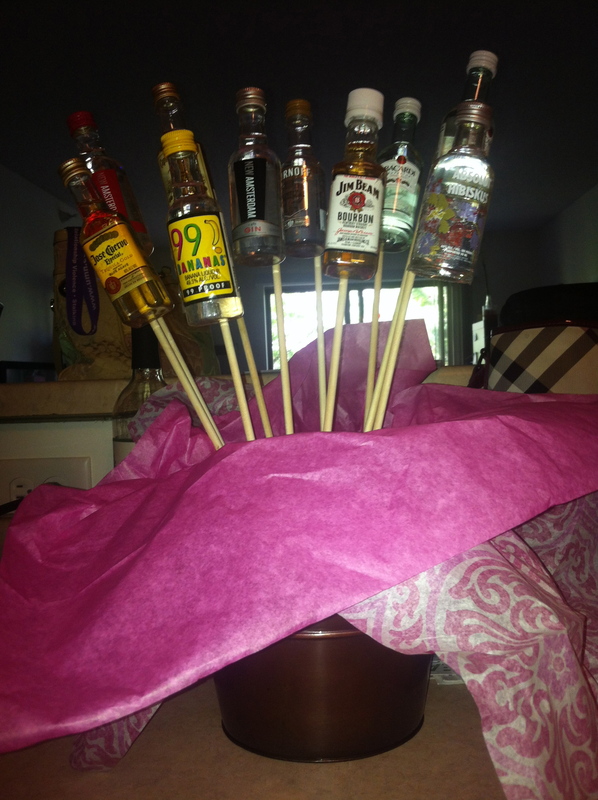 If I wouldn’t have thought of this at the very last minute, I probably would have taken the time to write out “Happy 21st Birthday!” on the pot, added green tissue paper to cover up the styrofoam, put a couple shot glasses in the bottom of the pot and maybe add some other fun goodies on sticks like a couple chocolate bars. I’ve always thought that DIY projects come out a little more special than getting a candid gift. You sound like a caring sis! Job well done! Not very long actually! After I bought all the supplies it was really only about 15-20 minutes!